Leung Pak Wo | People | HKUST Department of Physics "; myhtml += "
Professor Pak Wo Leung obtained his BSc at the University of Hong Kong in 1984 and PhD at Cornell University in 1990. After spending two years as a postdoc at the Florida State University, Professor Leung joined the Physics Department at HKUST in 1992. He had received many teaching awards, including the School of Science Teaching Award (2004), Best Ten Lectures (2006, 2007, 2012, 2014), and Michael G Gale Medal for Distinguished Teaching (2007). 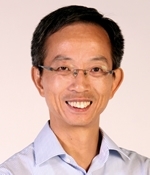 Prof Leung is now the Associate Dean of Science. Professor Leung's research interest is in the application of large scale and parallel computing to condensed matter physics, including low-dimension quantum spin systems and high temperature superconductivity. “Quantum phase transition induced by Dzyaloshinskii-Moriya interactions in the kagomé antiferromagnet”, O. Cepas, C.M. Fong, P.W. Leung, C. Lhuillier C, Physical Review B 78, 140405 (2008). "Magnon dispersion and anisotropies in SrCu2(BO3)2", Y. F. Cheng, O. Cepas, P. W. Leung, T. Ziman, Physical Review B 75, 144422 (2007). "Charge carrier correlation in the electron-doped t-J model", P.W. Leung, Physical Review B 73, 75104 (2006). "Hole correlation and antiferromagnetic order in the t-J model", P.W. Leung, Physical Review B 73, 14502 (2006). "Absence of hole pairing in a simple t-J model on the Shastry-Sutherland lattice", P.W. Leung and Y. F. Cheng, Physical Review B 69, 180403-1-4 (2004). "Asymmetry in the hole-doped and electron-doped t-J model", P.W. Leung, International Journal of Modern Physics B 17, 3367-9 (2003). "Low-energy spectra in t-J-type models at low doping levels", W.C. Lee, T.K. Lee, C.M. Ho and P.W. Leung, Physical Review Letters 91, 057001 (2003). "A numerical study of the staggered-flux and chiral orders in the t-J model", P.W. Leung, Physica C 364-365, 117-19 (2001-2002). "Low energy states with different symmetries in the t-J model with two holes on a 32-site lattice", P.W. Leung, Physical Review B 65, 205101 (2001-2002). "A model of pairing enhanced by stripelike correlations", S. Basu, R.J. Gooding and P.W. Leung, Physica B 312-313, 51-2 (2001).